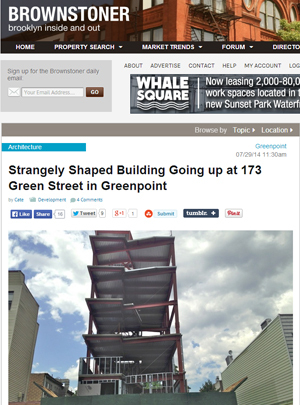 An unusually shaped building designed by architect Natalia Donskoy is going up at 173 Green Street in Greenpoint. The front of the building is not straight across but angles in four directions. 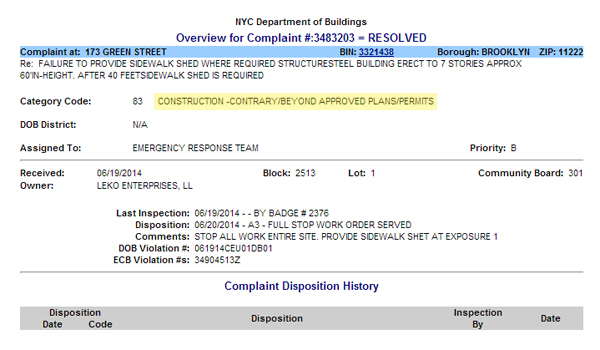 The Alt-1 permit calls for four stories and seven units. Donskoy, a former employee of Robert Scarano, is becoming known for sometimes mold-breaking designs in North Brooklyn. What do you think of the design? 1. Although it is clearly discernable in the second photo they elected to publish, no mention whatsoever is made of the Stop Work Orders. Yes, this property has not one— but two. These Stop Work Orders issued were well-deserved. Speaking for myself, the first sign that 173 Green may be a less-than-professional operation was when they commenced demolishing modifying the original structure which graced this lot. 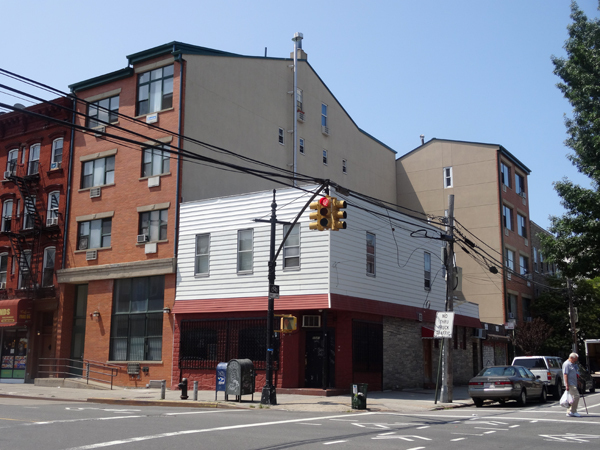 You can get an indication of what it was in the above photograph: it is a vestige of a one story extension of 1020 Manhattan Avenue. This extension sported two storefronts and a (questionably legal) studio apartment. I know this because I know the fellow who called it his home. Then the building sold and out he went. 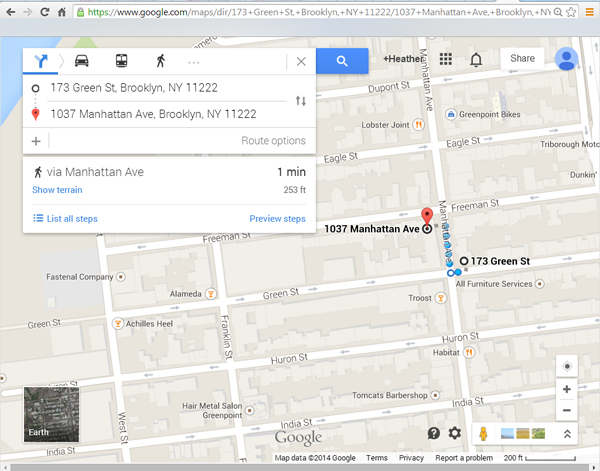 Note the address: 543 Bedford Avenue #264. Interesting things turn up when one “Googles” it. This and this to name a couple. 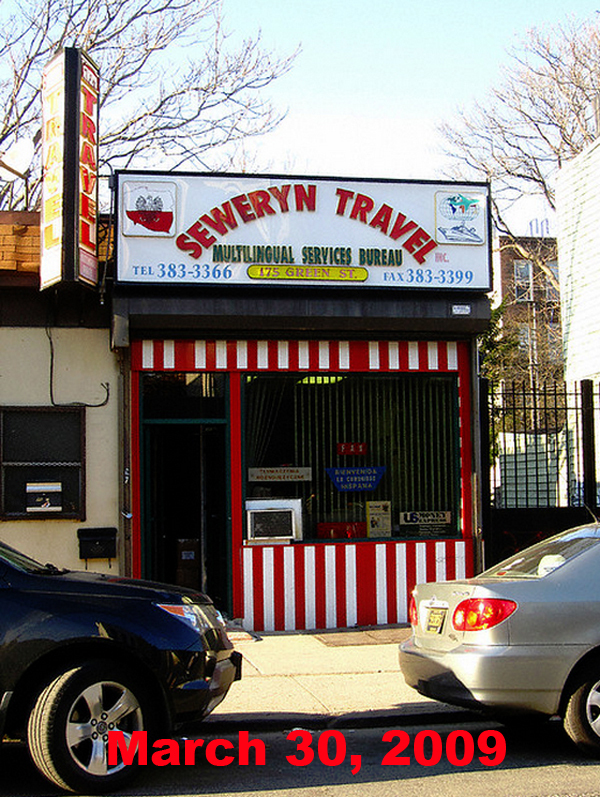 Anyway, with him went this rather charming Polish travel agency. It was operated by two brothers: twins who not infrequently wore matching outfits. For wont of a better way of putting it, it was vaguely reminiscent of something one would see in a David Lynch movie. But of course this was real life and that is what made Seweryn even more awesome— but I digress. 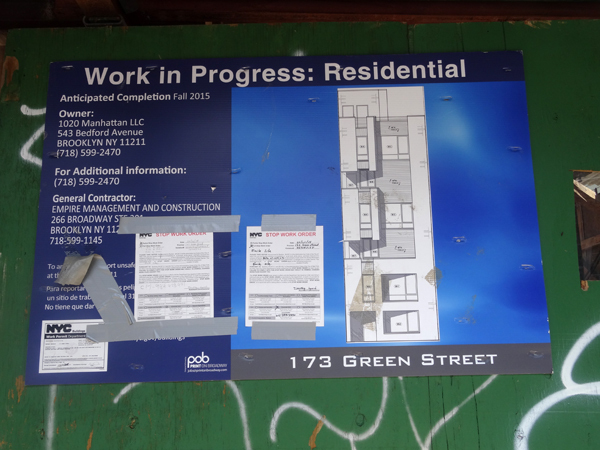 Let’s get back to what I saw which gave me the impression that something may be amiss at 173 Green. One morning I walked by and beheld three – four men wielding sledgehammers. These they used to break down cinder block walls. The rubble which resulted was taken, on foot/in hand, and dumped into a truck which was idling across the street. 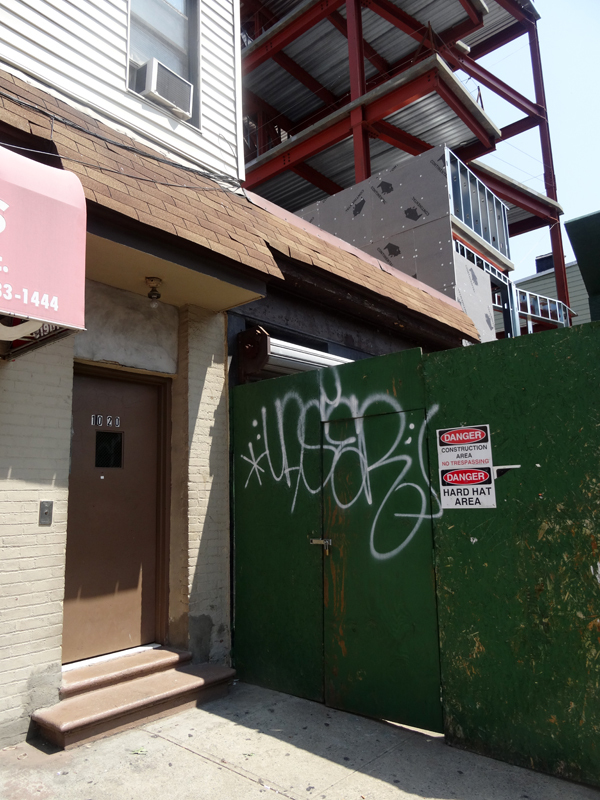 Speaking as someone who has resided in north Brooklyn for fourteen years (and blogged about it for over eight) I have seen more than my fair share of questionably professional “construction”. Bearing this in mind, I feel compelled to note this may well have been the worst. In any case it is certainly in the top three— and given what I have seen I can attest they come out on top of some mighty stiff competition. This is no small accomplishment. But why take my word for it? Let’s consult the professionals: the Department of Buildings! Surely they must have something to say about 173 Green Street since they have seen fit to post not one— but two Stop Work Orders? It has been my observation this is reserved for the most select of scofflaws. That’s pretty impressive. Let’s keep digging, shall we? A $5,000 fine. Hilarious. Let’s plow on! So help me, I think I am beginning to see a pattern here. Wow, this was less than two weeks ago! In any case, it would appear that the powers that be behind 173 Green Street harbor apathy— if not total and utter contempt— for the law. That name, Robert Scarano, sounds familiar. Oh wait now I remember! 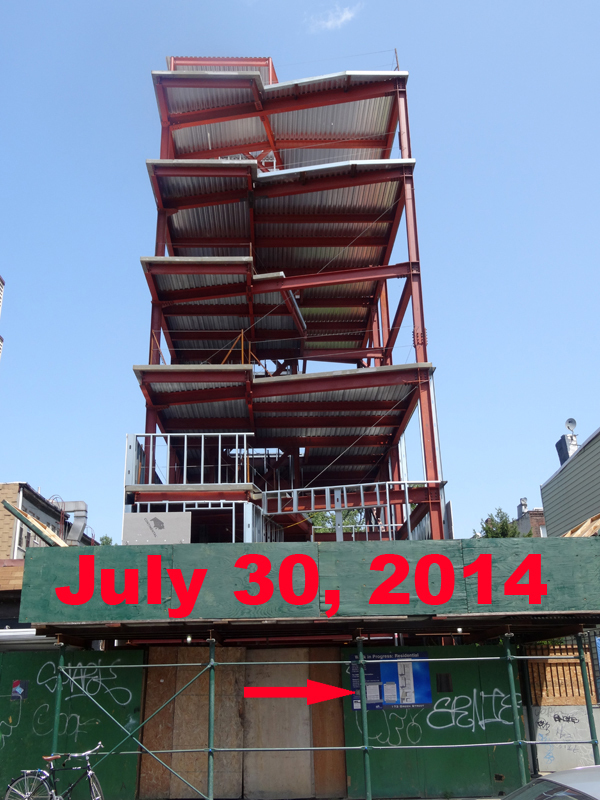 Construction in violation of a Stop Work Order— at 6:00 on Sunday morning. 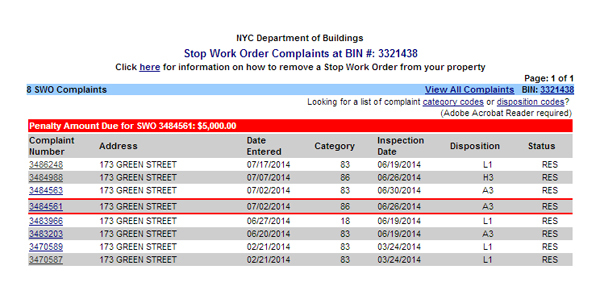 Violation of Stop Work Orders has been the modus operandi at 173 Green Street. One time even the police showed up. The adjacent Green Oaks Club property was inadvertently (?) divested of some of its aluminum siding. Those of you who know this community’s affection for the aforementioned product understand that this is probably a hanging offense. The use of step ladders for workers to get from floor to floor. What would OSHA say about this? 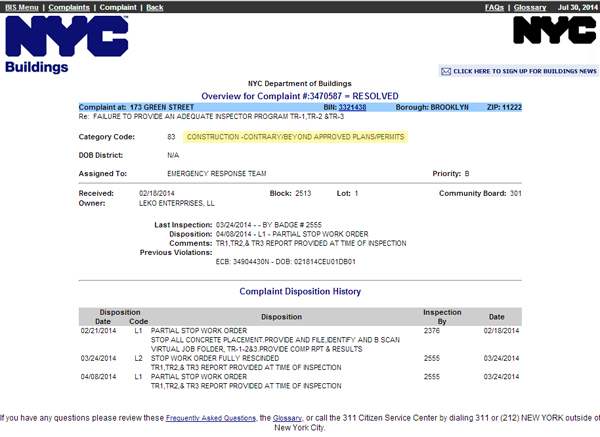 And a litany of other offenses which generally make people upset and call 311. Of course it will be ugly. That is the Greenpoint way! diggin your cross promotion here crappy. #1, it’s four floors and a mezz, the half floor above the 2nd is clearly a mezz. #2, concrete enforcement is on it. those guys don’t screw around and they’ve got a direct line to the borough commissioner and people with serious leverage. #3, CEU is under the umbrella of tim lynch, the mythical god of DOB who will not stand to see the city get embarrassed. he will go there and put a fence up himself if he has to, because he’s a little crazy, but he is not someone you want to see on a job site, ever. 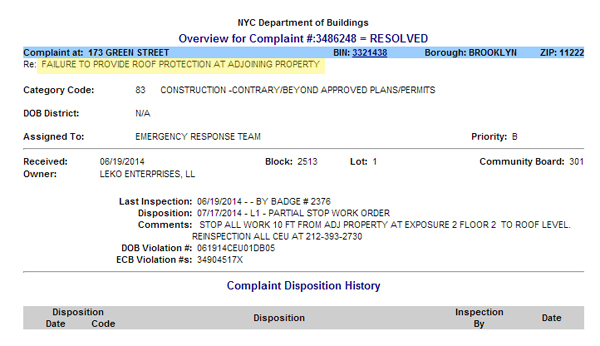 #4, DOB can and will post a vacate on the building, which would subject any violators and the developer to major civil and CRIMINAL penalties. 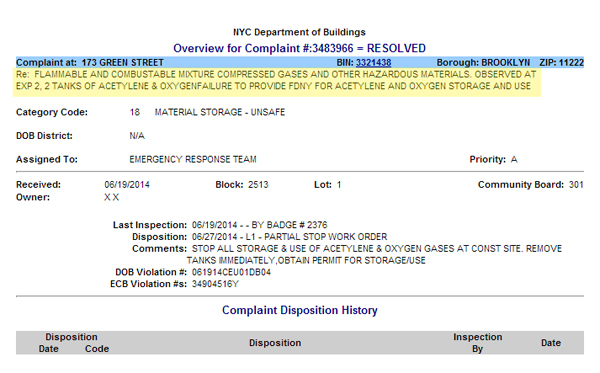 FDNY and NYPD are bound by these, and these things happen. #4, if they violate the SWO, in addition to $5k per violation, the city will generally walk around and ticket every loose guardrail, every missing screw from the job, every person not in a harness, everything. all of it. 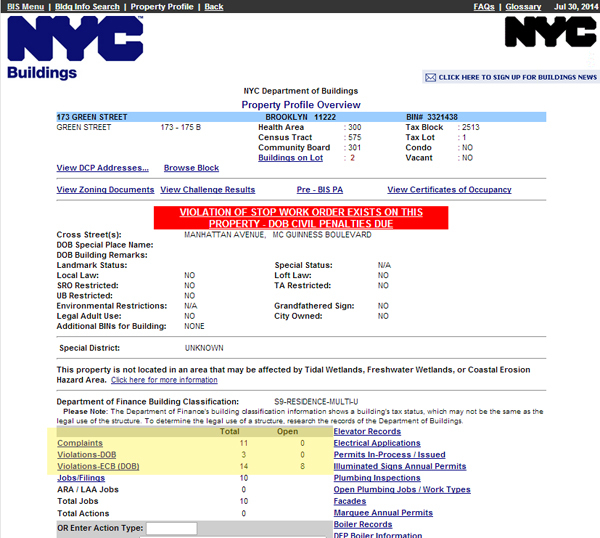 write that check for $15k to the city of NY please. #5, the developer will never get a CO unless all these fines are paid. they’ve got a roughly $20k tab right now. so what do you do? keep calling 311. 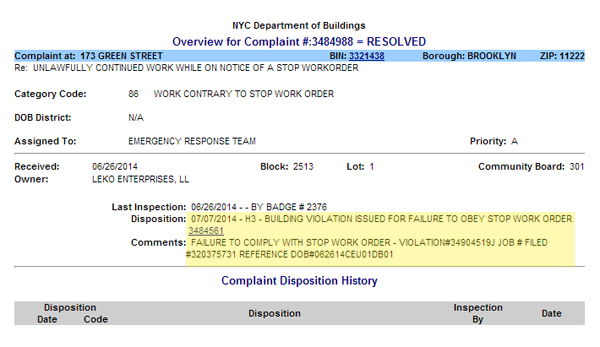 BIS listed a phone number for concrete enforcement in one of the complaints — 212-393-2730. it’s a cell phone, but you’ll get someone who knows the site and what’s going on. but be aware, many in CEU are very intimidating and they WILL ask how you got the number. it’s on BIS.